DETROIT, Michigan, January 10, 2011 (ENS) – The plug-in electric hybrid Chevrolet Volt was named the 2011 North American Car of the Year today at the opening press preview day of the North American International Auto Show at Detroit’s Cobo Center. The North American Car of the Year is selected by a jury of 49 automotive journalists from Canada and the United States, representing newspapers, magazines, websites, television and radio shows. For 2011, the Volt attracted more juror votes than the all-electric Nissan Leaf or the gasoline-powered Hyundai Sonata, which were also finalists. Touted by General Motors as an “extended range” electric vehicle, the Volt operates more like a plug-in hybrid. For the first 35 miles of its 379 mile range, the Volt is powered by the electricity stored in its lithium-ion battery. When the Volt’s battery runs low, a gas powered engine/generator kicks in to extend the driving range another 344 miles on a full tank. The Volt gets 35 mpg in the city and 40 mpg on the highway, according to General Motors. While the Volt’s suggested retail price is $41,000, buyers will be entitled to a $7500 tax credit for the first 200,000 vehicles sold. This is the third time Chevrolet has won the North American Car of the Year, and the fourth time for General Motors. Most recently, the Chevrolet Malibu was the 2008 North American Car of the Year. Akerson today led a Congressional Tour at 2011 NAIAS for a group of five House Democrats. House Minority Whip Steny Hoyer of Maryland toured for nearly three hours, checking out new vehicles and praising the industry’s turnaround. He was joined by four Michigan Congressmen: John Dingell, Hansen Clarke, Gary Peters, and Sander Levin. On December 15, 2010, retired airline pilot Jeffrey Kaffee became the U.S. first customer to take delivery of a Chevy Volt at a dealership in Denville, New Jersey. Kaffee’s is one of 360 Volts that was shipped from the Detroit-Hamtramck assembly plant in the second week of December. Others were delivered to Chevrolet dealers in the Washington, DC, area and are en route to California and Austin, Texas. The Volt is being manufactured using oil-soaked plastic boom material from last year’s Gulf of Mexico oil spill. General Motors has developed a method to convert about 100 miles of the material used off the Alabama and Louisiana coasts and keep it out of the nation’s landfills by using it to create enough plastic under-hood parts to supply the Volt’s first year of production. At the auto show today, Ford Motor Co. CEO Alan Mulally touted his own company’s progress. “We’re fighting for the soul of manufacturing in the United States,” he said. Mulally said Ford will add 7,000 new hourly and salaried jobs in the United States between this year and next. Mulally said Ford will launch C-MAX Energi, its first-ever production plug-in hybrid electric vehicle, and C-MAX Hybrid, a full hybrid variant, in North America in 2012 and Europe in 2013. C-MAX Energi will offer more than 500 miles of overall driving range. On the floor of the Cobo Center, Ford is showcasing the 2011 Fusion Hybrid, which gets 41 miles per gallon. The Fusion Hybrid is powered by an electric motor with an innovative nickel-metal hydride (NiMH) battery and a 2.5 liter gas engine. Fusion Hybrid can travel up to 47 miles per hour in EV mode alone, a higher speed than any other hybrid vehicle. Ford’s first all-electric vehicle, the Transit Connect van, is available now. Mulally said he supports the environmental goal of reducing emissions of the greenhouse gas carbon dioxide to below 450 parts per million. 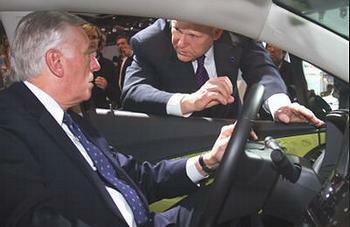 He challenged other carmakers to keep pace with Ford or be left behind in a cloud of 20th-century fossil-fuel exhaust.